In 1979, I traveled to the Pantanal of Mato Grosso, in Brazil, for the first time, on a consulting assignment. The objective was to evaluate the retention of water by several dams which were being proposed in the upper basin. An inspection trip to the Pantanal took our party to the town of Porto Murtinho on April 24, in time to witness its temporary relocation to higher ground, in preparation for the annual flood, which was expected to peak about three weeks later. Porto Murtinho is located close to the most downstream point of the Pantanal and the Upper Paraguay river. Therefore, it was not unusual for the annual flood to overflow its banks and send the flood waters moving slowly into the adjacent lowlands. I returned to Porto Murtinho in the summer of 1992, and this time the situation was quite different. With European advice, a polder had been built in the interim, and the town was now encircled by a 3-m high levee. This effectively circumvented the annual flooding and gave the town a newfound assurance. As I stood on top of the levee, I could not help but to think that the town's flood control success story rested on the loss of the view of the river. Thus, I confirmed once more that something good always has within it something bad. 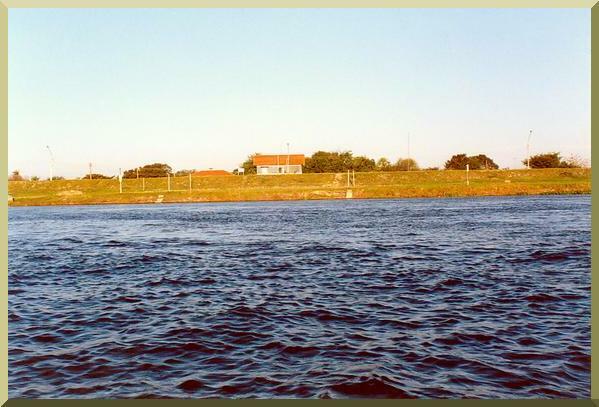 View of Porto Murtinho, Mato Grosso do Sul, Brazil, from the Paraguay river.